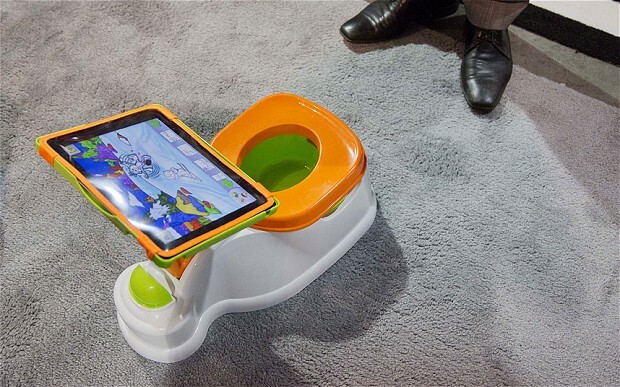 As awkward as it may sound (or look), “iPotty” by CTA Digital is one of those crazy products to come out of CES 2013, which claims to serve as a toilet training iPad accessory for babies. The iPotty comes with a clip-on cover to transform the potty for a child to use as a seat and a cover to protect the iPad from damage (via The Telegraph). Expected to retail for £25, the iPotty will go on sale in March. CTA Digital product specialist Camilo Gallardo said they have received great feedback from parents who think iPotty will be great for training. The company believes that the accessory can help children feel more comfortable by allowing them to watch videos or play games while answering the call of nature. The company highlights the number of iPad apps available for young children to use alongside the iPotty. Despite Apple’s minimum age rating on the App Store of 4+ many toilet training apps, including Oceanhouse Media’s Once Upon a Potty, have their own lower recommended age range of 1-4 years. The iPotty is compatible with the 2nd, 3rd and 4th generation of Apple’s iPad, and CTA Digital say it will work with other tablets in the near future. Would you buy an iPotty to toilet train your baby?